The textural characteristics of the saint’s liturgical vestments are now more defined. Below: When all the silver plates were removed, a wood carved statue of St Philip emerged. This year marks the 150th anniversary of the first solemn procession with the titular silver statue of St Philip of Agira at Żebbuġ, Malta. 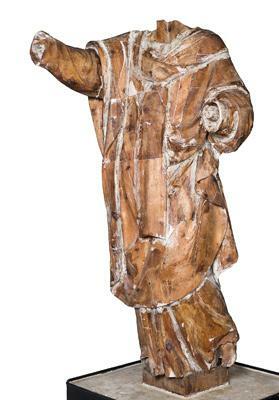 It was precisely during the liturgical feast of May 1864 that the much-awaited statue was carried around the town’s narrow streets for the first time amid the joy of the local community. In 1724, through the intervention of Grand Master Antonio Manoel De Vilhena, the parish of Żebbuġ obtained a relic of this patron saint – a piece from the wrist of his right arm. Gradually, the idea started to circulate that the village should have a statue of its protector. All options were considered. It was decided not to commission a local artist or to have a wooden or papier maché statue but to commission a work from Rome. Through the intervention of Mgr Paolo Pullicino, the authorities contacted the foremost professors of art, namely Tommaso Minardi and Friedrich Overbeck, and on their advice, they commissioned the young but extra­ordinarily-gifted artist Luigi Fontana of Monte Sanpietrangeli. Thanks to generous donations and to the hard work of Fr Salv Trevisan, the dream was fulfilled. The result was a processional silver statue which, in both its size and execution, is unique. 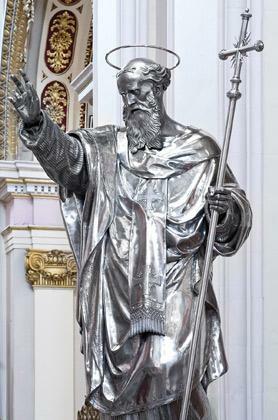 The statue of St Philip of Agira is executed in an academic Neo-Renaissance style and should be considered among the finest works produced in Rome during this period. It is a statue that inspires both awe and admiration. Along the years, the statue was unintentionally and inadvertently mis­handled on several occasions and this created problems for its preservation. Among these were the handling of the statue during processions over the past 150 years and the manner in which it was kept in the different niches at Żebbuġ parish church. Humidity caused corrosion and created movement of the interior wooden structure. Dirt had become embedded and the statue’s silver plates had gradually become disjointed. During World War II, the archpriest of that time, Fr Paolino Galea, had decided to store the statue in the church’s crypt, under the current sacristy. It remained hidden there behind a stone wall for nearly two years. Also, during occasional repairs over the years, proper material was not used. Quick fix-it restoration attempts were not up to modern standards. Furthermore, some silver plates showed undue stress and hence new points of tension where created. The statue’s head had started to tilt downwards and ended up resting on its chest, creating a dent. There was a clear need for a rapid intervention on the statue before its structural stability became compromised. Archpriest Daniel Cardona, the clergy and an ad hoc committee took the task to hand and embarked on a project to restore the statue. Having obtained the necessary permission from the Diocesan Com­mission of Catholic Cultural Heritage and having made sure that all the safety precautions and insurance requirements were in place, the go-ahead was given. The parish, knowing the complications of such a specialised project, wisely opted to commission the work to a joint venture made up of Victor Azzopardi Ltd and the conservation and restoration co-operative ReCoop. This team consisted of a pool of local experts from various professions, namely silversmiths, conservators, metal experts and art historians. Once the restoration methodology was defined, work started in October 18, 2013. The restoration team was ethically and morally bound to thoroughly respect the original work of Fontana. In addition, since no restoration lasts forever, every single intervention was to be reversible. The rules and charters of international ethics were fully observed and all interventions were rigorously documented. The process included the dismantling of the silver plates, most of which were modelled through beaten plates. The statue is made up of 76 silver plates of various sizes, with the majority of them around 800mm thick. These silver plates were all cleaned and painstakingly conserved. The head, hands, serpent and the feet of St Philip were also restored. Along the way, there were some major discoveries. When all the plates were removed, a wood carved statue of St Philip emerged as the structural anima of the main body of the saint. In addition to this, designs on the wood made by the artist himself were discovered. This wooden statue was glued to the central structure, that is, the foundation of the statue which consists of four wooden inner beams. It was found that the original glue had loosened and detached and other delicate parts, like the shoulders, had deteriorated. It was precisely these loosened wooden parts and the de­terioraton of specific areas with plaster that were exerting pressure on the outer silver plates. Due to this force, the statue was at risk of further disintegration which could have eventually led to its collapse. The team of ReCoop restorers carefully replaced the deteriorated gesso and re-glued the wooden parts in their original state. Following this, the numerous restored silver plates were reattached to the wooden statue. Hundreds of silver nails were used to nail all the plates. The last nail was driven, rightly so, by the archpriest himself, under due supervision. The end product was beyond ex­pectations. The work performed was not a cosmetic cleaning but a major restoration and conservation achievement. The statue has now been restored to its original beauty and the features of the human body as well as the textural characteristics of the saint’s liturgical vestments are more defined. The original finish of the sculptor is clearly visible. All the processes, from the very first step of removing the statue of St Philip from its pedestal, and all the interventions right up to the transportation of the statue back to the parish church, were photographically documented by photographer Joe Borg. All this material will eventually be published in a book to commemorate this extraordinary project. The statue was returned to Żebbuġ parish church on April 25 when a soirée was held with talks delivered by Fr Cardona and Prof. Keith Sciberras. The Amadeus Chamber Choir and Orchestra, led by Mro Robert Cefai, entertained those present. On April 27, the statue was officially and solemnly installed in its proper place in the niche.